We encourage you to reach out to your family, friends, and everyone you know and ask that they attend to support our educators at this event. The rally will start at 3:30 p.m. but we ask that you please arrive by 3:15 p.m. 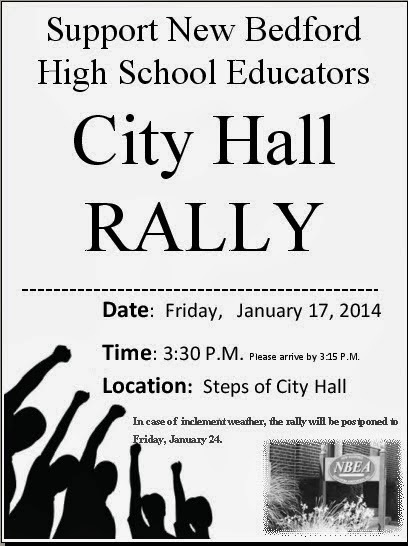 In case of inclement weather, the rally will be postponed to Friday, January 24, 2014. Looking forward to standing in solidarity with New Bedford Teachers! Sandra Sylvia supports all New Bedford High School Educators! Lori(Carreiro)Silveira supports her retired teachers/retired co-workers, any still remaining in the NBPS, and all of my colleagues doing the difficult work under extreme conditions each and every day in each and every school! Much love and support to teachers in the NBPS system. Bet the kiss a….es won't be there. Bryan Hancock supports all New Bedford High School Educators! This Superintendent is a heartless person and intent on following through with mass firings. She must be derailed. We have tried to appeal to her humanitarian side, but Durkin is made of stone. She views us as dispensable commodities with little, or no value. We are much more than that. Barbara Conlon supports ALL New Bedford Educators! The administrators of NBHS had a responsibility to be proactive and seek and implement new reforms to address the areas of need. A true professional would educate him or herself, and apply that knowledge to the current situation. They would be relentless in their pursuits. This was not the case. The teachers picked up the slack as committees were formed. But when administration expects you to do all the work, and doesn't support you, your efforts become deflated. What is taking place now is the result of neglect by those who failed in their responsibility. Their misconduct is reflected upon the teachers as we shoulder the blame. Teo and Sue Reis support all New Bedford Educators! Patty Benner supports NBPS and NBHS teachers!